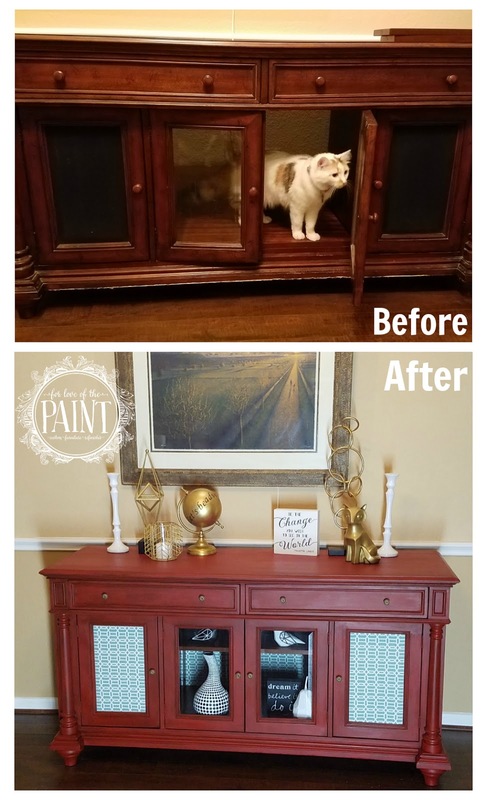 This console table was a hand-me-down gift from my in-laws, and we were super thankful for the new piece! It had some surface damage from a wayward Roomba, as well as from a little dog scrabbling to get under it to chase a ball, so we knew we could give it a whole new lease on life with a little TLC! It actually ended up being my Mother's Day project, and I absolutely love how it turned out! I used Annie Sloan Chalk Paint in Emperor's Silk, which is one of the first chalk paints I ever purchased :) . My home needs more color, so we even added to it with a teal geometric fabric on the door panel insets, and upholstered plywood to replace the missing back. We replaced the wooden knobs with smaller bronze ones (that I ended up turning gold with a little Rub N Buff since the bronze was too dark) and styling with gold, black, and white to add to the modern feel. I LOVE the end result!! Don't worry - it was still cat-approved!